With Fall here I have always wanted to make Candied Nuts, but for some reason I just never did, well now I can say I have. Ellie had a recipe for Candied Pecans and her description from them, she said they are addicting and addicting they are! I didn’t have pecans, so I decided to use almonds instead. I love my almonds. When I named Ellie’s Candied Pecans, I by accident changed the name to Spiced Almonds. I think it’s because I cut back on the sugar and they do taste sweet, yet they have a slightly spicy flavor to them due to the nutmeg and cayenne pepper. My Husband said they tasted like pumpkin to him. My guess is that it is due to the nutmeg and cinnamon spices. I think he’s kind of right, and you know I like my pumpkin! No wonder why I like this recipe. I love these nuts!!! They are so perfect and so darn good!!! I bet you can’t eat just one! This recipe is really easy to make and the smell from the nuts roasting in the oven made my house smell so good!!! I’ll tell yah, roasting nuts is so much better than plain. I also like them better when I roast them compared to buying them already roasted. They seem softer and have so much more flavor. I have even cooked nuts in my skillet, once you smell their aroma, the nuts are done!! Roasted almonds coated with sugar, nutmeg and other spices. Preheat oven to 300 degrees F. Line a baking sheet with parchment paper and set aside. In a medium bowl, whisk egg white until the whites have foamed into small white bubbles. Add sugar, spices, and salt. Whisk the mixture until thick and opaque. Once thoroughly coated, spoon the pecans onto the parchment paper. Leave as much extra coating in the bowl as possible. Remove from oven and allow to cool completely before digging in. I highly recommend checking out The Bitchen Kitchen for some wonderful unique recipes! I’m off to make some granola!! Have a great week! 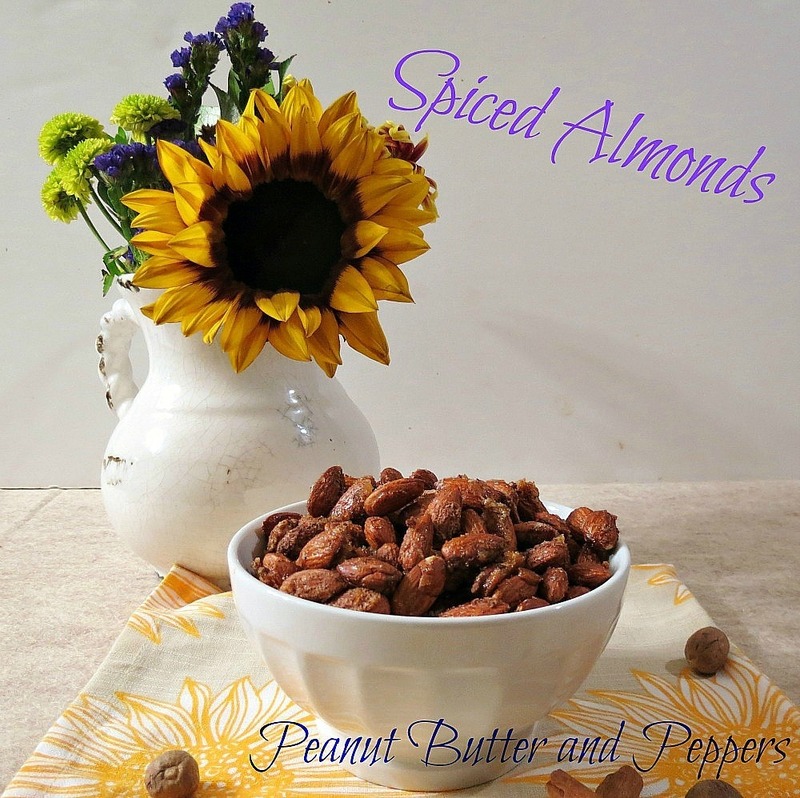 I love spiced almonds, and your pictures are just amazing! I KNOW I can’t eat just one, these taste treats will just disappear. Love the intro photo with the sunflowers. Thank you! It’s hard to eat one or one serving! Spiced nuts ar easy and delicious. Great food gift for the holidays, too! That’s a great idea! I think I will be making these for gifts this year! Yum! I have a gallon sized bag of pecans in my freezer that would be perfect for this recipe! Oh you have to make them! You’ll love them!! I had you this month and did your apple cider. It was awesome in every way. Thanks. Oh, I am so glad you liked it! I have to pop over and check it out!! Awesome – I make Sugar coated pecans in a very similar recipe – but I know I’d love almonds also. p.s. I really love your last photo – so festive and perfect! I love munching on nuts. These will be so perfect for a grab-n-go snack as I run out of the door for work or errands. I just had a hand full of Almonds for a snack, these look delicious! Thank you!! I do love almonds, plain or candied! I think I could eat a whole bowlful of these- thanks for the great idea! Anytime! I could eat the whole bowl full, especially when there still warm and gooey! 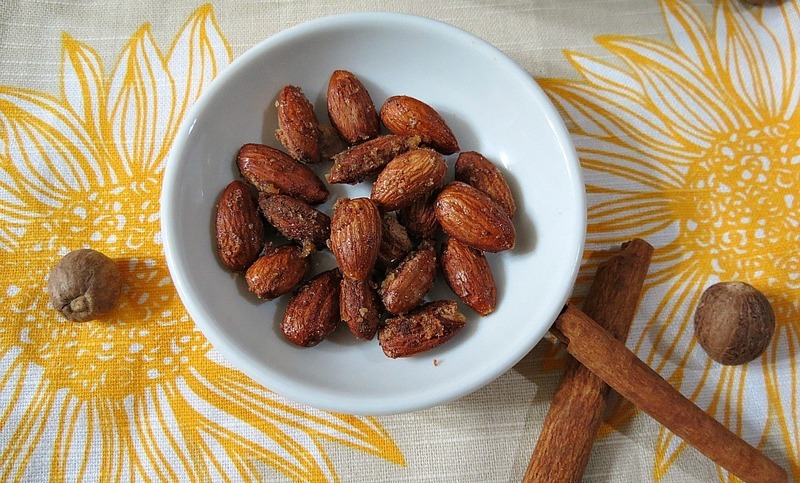 Your spiced almonds look magnificent! And I’m loving that sunflower tea towel…beautiful! Make them, they are so good! You won’t be disappointed!! Those look awesome – I think I’d eat the whole batch in one sitting 🙂 Great choice. Right about this time last year I went thru a major almond-roasting love affair. They are so good all candied up like this. I never made them with egg whites, though. However, that seems to be a popular way to get the coating to stick. Must try it! 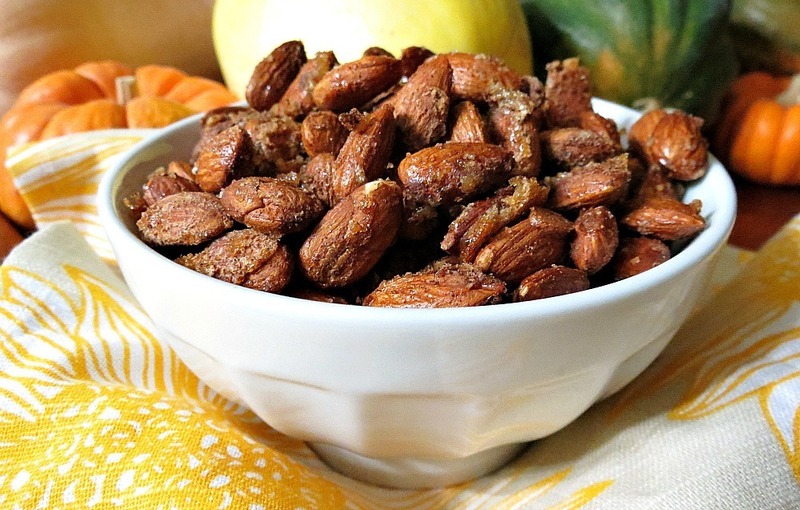 Your post just reminded me of how much I love candied almonds! The spices you use sound so good, I can’t wait to try this!! Nice. I was actually thinking to myself last night, while making my smoothie, that candied almonds would have been perfect in my smoothie. Gr8 minds think alike. Sounds yummy!!! I never put nuts in a smoothie, but I bet it would taste great!! Candied almonds are one of my favorite treats. I love the pepper in this version! Thanks! I wish I didn’t make them because i can’t stop eating them!! Hi, thank you for nice recipe. I am stopping by from euforiaconfections.com please come and visit https://www.facebook.com/EuforiaCake and enter Halloween Contest to win 12 cake sampler of euforia thousand-layer cake. Thanks for the invite! A 12 cake sampler, yes please!! !